This paper is based on an interview made by Jean-François Kelly with both wrestlers of the Super Smash Bros. It has been written by Jean-François Kelly together with Jeff Bathurst. Pictures by Josianne Tétreault. Translation by Daniel Picard. I’ve just come to realize that the work I do for Lutte Québec has made me a very lucky guy, indeed. Following an interview made with one of my indy wrestling idols, Mike Bailey, I’ve had the opportunity to meet the Super Smash Brothers, which was to prove to be another exciting encounter. This interview has told me how wonderful it is to talk with people who know exactly what they want to do with their lives. In our younger years, we’ve all struggled to make the best life-long choices for ourselves; some of us are still questioning their decisions. As for the Super Smash Bros, they know very well what they want to spend their lives with: being pro wrestlers to entertain their fans. When it comes to the squared circle, some wrestlers make the show more thrilling and convincing than others. 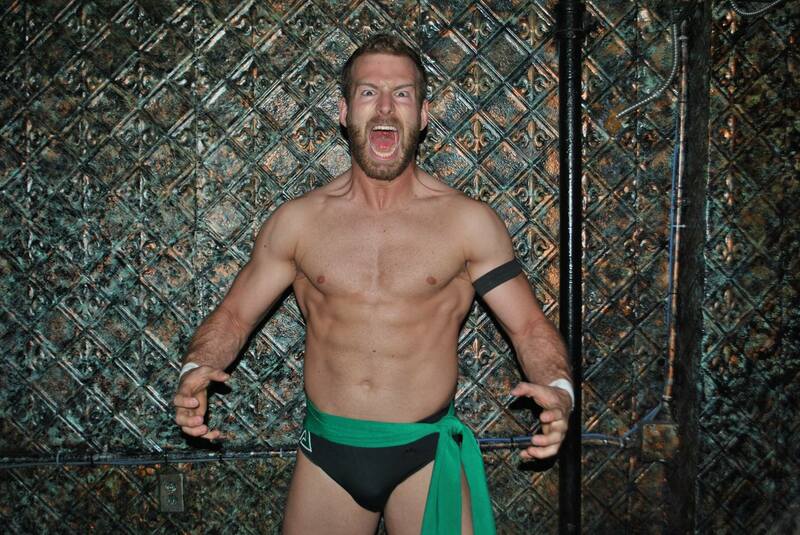 Mike Bailey is, without a doubt, one of the best Quebec wrestlers working presently in the States. 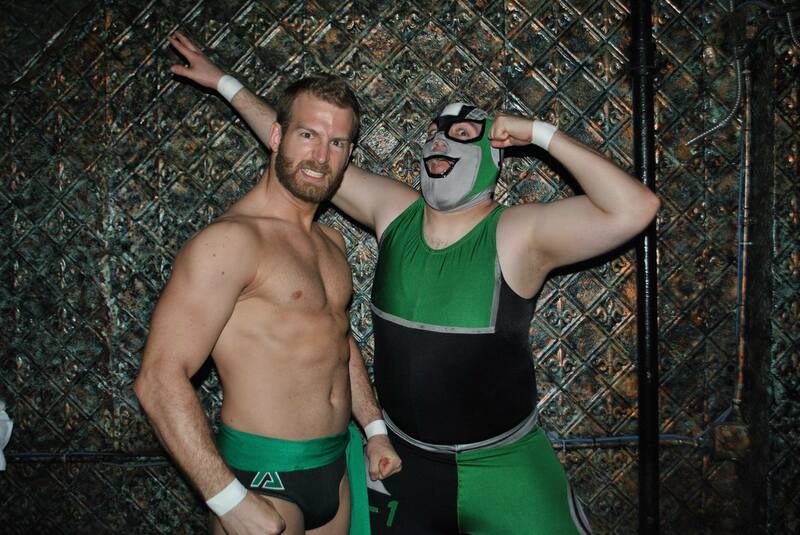 In my opinion, Buxx Belmar and the Tabarnak de Team (TDT) will become the next big draws of the wrestling scene. A quick glance on the past indy scene brings obviously back the names of Kevin Owens (Kevin Steen) and Sami Zayn (El Generico); the Super Smash Brothers are now among my own roster of the most attractive and convincing wrestlers. Sadly enough, since 2013, US fans can’t enjoy the acrobatics of this breathtaking tag team guys no more. I’ll explain why later. Although most Quebec fans know them already, some of them are not yet acquainted with this stunning duo. I’d like to introduce them to you. Nicolas Dansereau (better known as Player Uno in the ring) was the first of the Super Smash Bros to begin training. At age 14, he joined the Canadian Pro Wrestling (CPW) school of wrestling in Hull (since rechristined Gatineau) to attend trainer Wild Dangerous Dan’s courses. Soon enough, Uno met Kevin Owens and Sami Zayn, striking up a friendship with both of them. Incidentally, Sami would suggest Nicolas to take up Player Uno as his in-ring name, an implied reference to Nintendo video games. Zayn first thought to take up that name, but later decided to use El Generico instead. 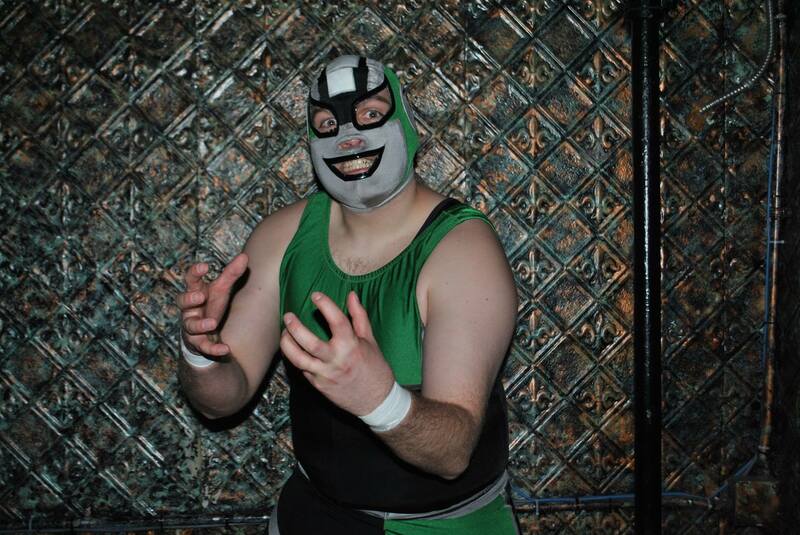 As for Marc Dionne, better known under the name of Player Dos, he’s also made his debut with CPW. He came across this wrestling fed in 2004, while a friend was bringing him to attend one of their shows. Interestingly enough, Kevin Owens against … Player Uno was the first bout that Marc attended that evening. Dazzled by what he saw, the then 15-year-old wrestler-to-be called CPW the week after to get registered to the wrestling courses. That’s when he first learnt to perform the basic moves as well as running the ropes, together with Wayne Cryderman and Tommy Blade. Almost eight months later, Player Dos got his first serious assignment for CPW. Nicolas and Marc met in 2005 while training at CPW. Wrestling each other again and again, they rapidly became a welded team. Together with their good friend Frank Morin (known as Stinky The Homeless Guy), who sadly passed away from cancer in 2011, they made up a trio called Triforce. However, it was while working with the International Wrestling Syndicate (IWS) in 2006 that the Duo took up the name Super Smash Bros, based on a suggestion made by the late Michael Ryan (Llakor). At the same time, Marc took up the character of Player Dos. 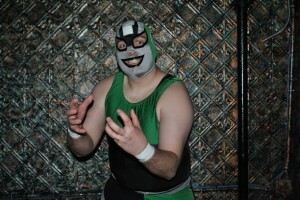 Due to his look and colorful personality, Player Uno was already popular among the fans; understandably enough, the Victoriaville wrestler imagined a character that would support the tag team own personal brand. From then on, popularity was on the rise. The Duo was being asked to wrestle for other feds, MWF and NCW among others, while also working for some Ontario feds. Dazzling fans wherever they go, both wrestlers finally landed in the United States, where they took part in Chikara’s King of Trios tournament in 2008, and then had a one-year stint working for Combat Zone Wrestling (CZW), followed by another stint for the New-York-based fed Squared Circle Wrestling (2CW). In 2010, the Tag Team began wrestling for Ring of Honor (ROH), under Adam Pearce’s supervision, who is now trainer and producer for NXT. There they clashed with big names of the wrestling business like Cesaro (Claudio Castagnoli), The Young Bucks and their Quebec fellow countrymen Kevin Owens and Sami Zayn. Despite their outstanding skills and tremendous popularity among the fans, they got released after one year of work within ROH due to a change in the Company’s Management Board, which would prefer technical wrestling skills over larger-than-life characters. Following their release from ROH, the Super Smash Bros got into a period of doubts and questioning. They were not being asked to wrestle as often as before on American soil. That’s when, in September 2011, they got a call from Pro Wrestling Guerrilla (PWG), through Kevin Owens, whom did not hesitate to praise their skills to the Company’s Management. Both wrestlers travelled to California, where they took part in some kind of boot camp for PWG. From the start, the promoter had some doubts about both wrestlers’ look. However, following their first bout, the crowd got frenzied. The Duo got a tremendous ovation, with the crowd chanting “Please come back” to their new rookies. As soon as they got back to the locker room, the Boss hastily offered the two Quebecers bookings for future shows. Aiming to work for PWG for some years, that was a crowning point for the Duo. Barely arrived in Calfornia, the Super Smash Bros experienced a brilliant success within PWG. In April 2012, they won the Dynamite Duumvirate Tag Team Title Tournament, wrestling three times during the same evening, to become the first contenders to the PWG World Tag Team Championship. The month after, the Duo defeats the Young Bucks, and got the Title. The Duo will keep the belt for almost nine months, securing their place among the best teams in all the indy wrestling scene. With the wind now in their sails, both wrestlers saw their US careers hit a wall. In April 2013, while travelling to take part in a PWG show, Nicolas and Marc are told by airport customs officers that from now on they must have a visa in order to work on American soil. For those who are not acquainted with the procedures, a US work permit may take several years to obtain and costs around $2,500. The Duo was able to fulfill their last obligations, but had to apply for a visa as soon as they got back home; failure to do so may see them banned in the US for ten years. Although it has been two years now since Player Uno and Player Dos haven’t wrestled South of the Border, they still might rejoice over the thought that US fans haven’t forgotten them. Each time PWG holds a show, our Duo gets tons of words of encouragement from the fans there, which eases a great deal of this unfortunate ordeal. The words that are heard most often are: ‘’The show was fantastic, but it would have been more fantastic if you would have been part of it.’’ That’s the reason why the Super Smash Bros are determined to obtain their visa. Their US fans asking for their comeback day after day, our Duo is eager to meet their fans again. American fans may rejoice, though: If all goes as planned, Player Uno and Player Dos might obtain their visas next June, and come back wrestling on their soil. Our famous Wrestlers are eager to climb back into the rings of PWG and CZW, facing their newcomers like Trevor Lee, Monster Mafia and, of course, Mike Bailey. They pledge to come back stronger, faster and better skilled than ever before, with a new personality which will show their fans that they know how to throw a party. If you haven’t been acquainted yet with the Super Smash Bros, then you must loose no time to get to know them. Our Duo is ready to storm the US wrestling scene again; with the recent wave of independent wrestlers being hired by NXT, our Duo might have a chance to follow in Kevin Owens and Sami Zayn footsteps. Whatever happens, the Super Smash Bros are more eager than ever to go back in the ring and to make the US indy scene their Mushroom Kingdom. At the time of writing, in May 2015, the Super Smash Bros wrestle on a regular basis for C4 Wrestling, SMASH Wrestling, Alpha-1 Wrestling and Battlewar.